Josh Sweat, Josh Adams make Eagles debuts. Jordan Matthews makes his season debut. 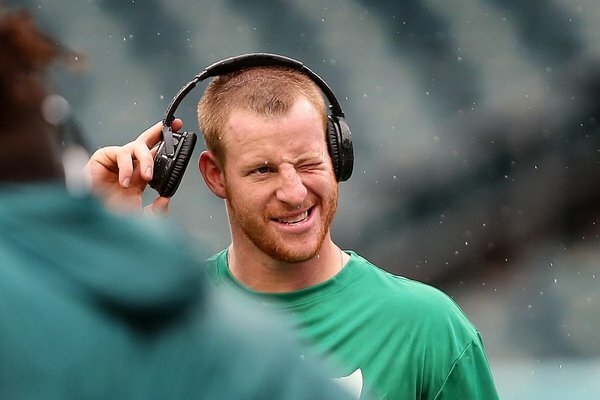 Eagles inactives are as expected: Ajayi, Sproles, Sudfeld, Warmack, Mailata, Pryor and Jeffery. If you were hoping that Alshon Jeffery might magically be activated today, sorry to disappoint. As we gear up for today's coverage of the #Eagles and Colts, be sure to sign up for our Early Birds newsletter. Josh Adams is back wearing No. 33. Eagles averaging just 1.8 yards per carry on first-quarter runs. Eighteen yards on 10 attempts. Eagles are introducing the offensive players. Carson Wentz will be last. BREAKING: The #Eagles have benched Nick Foles. Eagles win the coin toss. D. Pederson deferred, as he usually does, even with C. Wentz in the lineup. Just noticed that Josh Sweat is active for the first time. I'm kinda slow. Wendell Smallwood gets the start at running back, but you'll see a lot of Corey Clement today. Hi folks. Marc will be here in a moment. We're having some technical difficulties. Josh Perkins starts for the Eagles and was the target on the first play. Eagles like his versatility. Eagles are going with a lot of empty backfield on first drive. They've been playing 3 TEs, although Perkins is playing as a WR. C. Clement has been split wide past two plays. Carson Wentz first drive -- TD. Workmanlike. Ends with 13-yard TD pass to rookie TE Dallas Goedert, his first in the NFL. #Eagles , 7-0. Carson Wentz was 5 of 7 for for 55 yards and 1 TD. His seven targets: Three to J. Perkins, Three to Z. Ertz, one to D. Goedert. Eagles relying on their TEs with WRs undermanned. 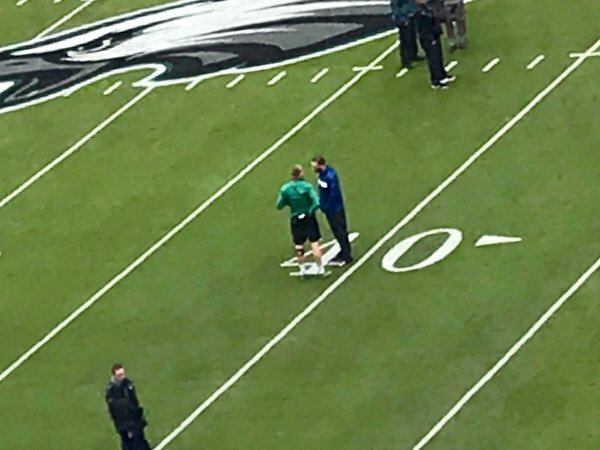 Carson Wentz is clearly rusty, and the #Eagles made a mistake by not playing Nick Foles today. My col- yeah forget it nobody's buying that one. A lot of empty backfield on that drive. A surprising number of passes to Joshua Perkins (should it be at this point?). And Carson Wentz picks up where he left off in the red zone -- looked off his first read and found an open Dallas Goedert vs. zone. #Eagles , 7-0. That TD were the first first-quarter points by the Eagles this season. It's just the third time in the last 12 games dating back to last year that they've scored on their first possession.